You’ve heard me talk about the windowpane/grid print already, but another variation on it that I love is plaid. It’s a fall/winter staple print, so you don’t have to worry about it going out of style. If you saw my Instagram last night, you’ll know I’m hosting an event at Nordstrom at the Houston Galleria on Saturday, October 19th to promote the launch of Topshop collections in stores. I was trying on looks and settled on this skirt as one of the pieces I’ll be wearing. 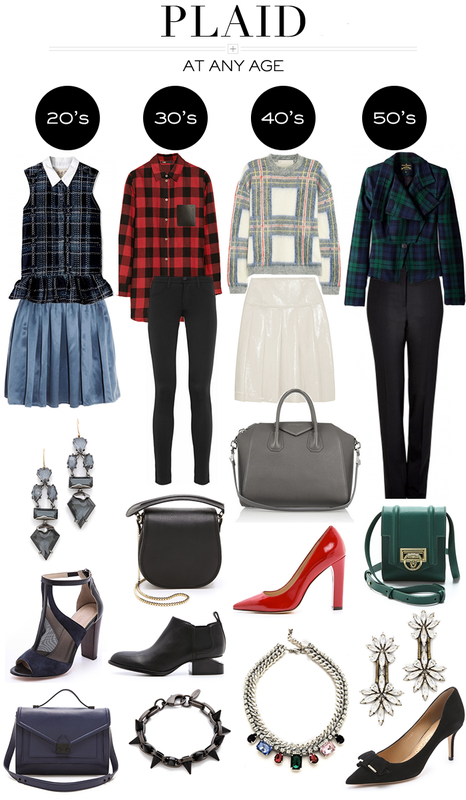 The peek-a-boo plaid is adorable and the silhouette is totally on trend this year. I’ll be sharing more details on the event later this week, but mark your calendars if you’re in Houston so you can stop by! Great choices! I love the boots. you’ve found the best plaid pieces. I would never wear plaid, but I love the looks above for other women!!! I love these picks but it makes me SO sad to have to look at the column labeled 30s – eeek! I love this collage you made! I’ve been crazy for plaid lately as well :) I love how it’s been around for so long and such a classic pattern thats coming back into style! I am dying for the skirt you chose to wear to your event – so sad they are sold out of my size!! :( Have a great day! Of course I love this post! Plaid AND one of your At Any Age posts? Yes please. I adore plaid….and have every since my teens! My fave look is the one for the 40s…oh no?! am I an old soul? Great 50’s look. Love both pair of earrings! I’d be every age to rock any of those outfits. Really lovin’ the 30’s picks. And those Alexander Wang shoes are amaze!